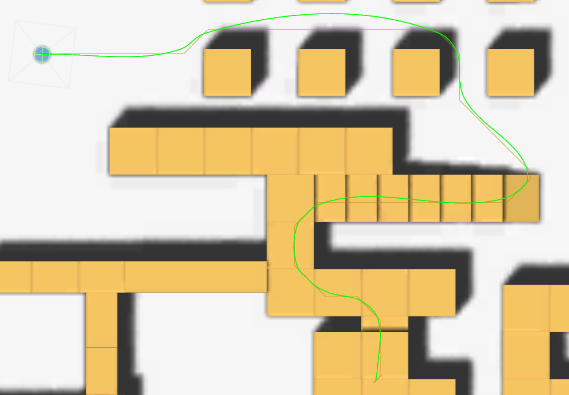 This modifier can smooth a path by either moving the points closer together (Simple) or using Bezier curves (Bezier). Attach this component to the same GameObject as a Seeker component. This component will hook in to the Seeker's path post-processing system and will post process any paths it searches for. Take a look at the Modifier Priorities settings on the Seeker component to determine where in the process this modifier should process the path. Several smoothing types are available, here follows a list of them and a short description of what they do, and how they work. But the best way is really to experiment with them yourself. Simple Smooths the path by drawing all points close to each other. This results in paths that might cut corners if you are not careful. It will also subdivide the path to create more more points to smooth as otherwise it would still be quite rough. Bezier Smooths the path using Bezier curves. This results a smooth path which will always pass through all points in the path, but make sure it doesn't turn too quickly. OffsetSimple An alternative to Simple smooth which will offset the path outwards in each step to minimize the corner-cutting. But be careful, if too high values are used, it will turn into loops and look really ugly. Length factor of the bezier curves' tangents'. Roundness factor used for CurvedNonuniform. Number of times to apply smoothing. The length of the segments in the smoothed path when using uniformLength. Offset to apply in each smoothing iteration when using Offset Simple. Type of smoothing to use. Determines how much smoothing to apply in each smooth iteration. 0.5 usually produces the nicest looking curves. Number of times to subdivide when not using a uniform length. Toggle to divide all lines in equal length segments.